Indonesia consists of 36% of main land and islands, and 64% of sea. So, besides having a range of beautiful landscapes and volcanoes, Indonesia also has countless water resources and underwater beauties. Not to mention the beautiful beaches stretch along the country, for Indonesia is the biggest archipelago country in the world. As an Indonesian, I am aware that my country is an epicenter of biodiversity, hosting a greater variety of marine life than anywhere else on earth. Having bunch of dive sites throughout the archipelago, Indonesia provides many kinds of diving style to try. From challenging drift diving, extensive reef diving, amazing night diving, unique muck diving, and stunning steep walls to enjoy. This fact makes me curious of knowing more of the underwater world and decided to take a diving license to explore deeper and longer. And once I saw how underwater world looks like, I never stop craving for more dives in my life. Since I live in a beautiful Bali island, which surrounded by some popular dives area, I usually go for a dive trip every few months. 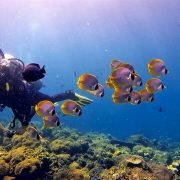 Tulamben, Amed, Padang Bai, and Menjangan Island are the perfect option for recreational dive as well for beginner divers. For the adventure seekers and big fish lovers, Nusa Lembongan and Nusa Penida Island in Bali or small islands in south west Lombok are the answer. So far, my favorite dive sites are Tulamben with its Ship Wreck and Nusa Penida with its Manta Point. Diving with some Manta Rays surrounds me gives a special sensation and makes me more grateful for a chance to see such a beautiful giant fish yet friendly. When I’m not diving, snorkeling and skin diving are my other water activities. With its pristine water, Bali and Lombok offer the easiest way to enjoy the underwater. You can get in a glass bottom boat, and enjoy the trip to the snorkeling spot by watching the underwater life beneath your feet. Of course Bali and Lombok are not the only underwater paradise in Indonesia. 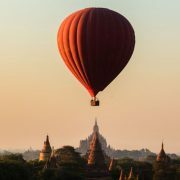 There are a lot more destinations that have different beauty to offer. East Indonesia is famous with its underwater heaven. From Karimun islands in East Java, Wakatobi islands in Celebes, Mollucas islands, Nusa Tenggara islands, until the famous Raja Ampat in West Papua islands. Not to mention, underwater of Weh island in the very west of Indonesia also surprisingly beautiful. All of them offer you the stunning underwater experience that you will never forget. Spare your time to enjoy the sea and underwater when you visit Indonesia. 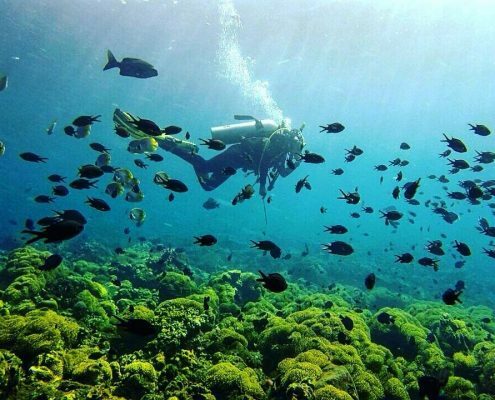 If you want to peep a bit of underwater beauty, take a snorkeling tour. 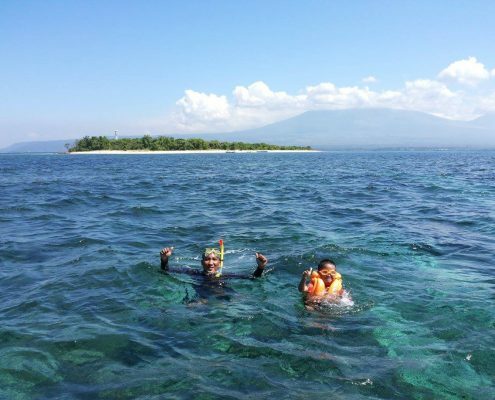 By floating with mask and snorkel, you already can see the corals and colorful fish decorating the underwater world. If you are curious what lies down there and want to explore deeper, take a diving lesson to get a license. Or if you only have limited time, join in a Discover Scuba Diving trip. It allows you to dive up to 12 meters without holding the license. And trust me, once you get down there and see the underwater beauty, you will never see the world in the same way you see it before! So, ready to see the other world under the water? Grab your google, snorkel, and fins! And let’s enjoy the underwater heaven of Indonesia.